Around two weeks ago, two things happened that I didn’t expect. I went to the funeral of a dear friend. Norman was a phenomenally curious and wise man, and while I was trying to pull myself together to write a eulogy, I was reminded of his blogs. One of them, “A body’s in trouble: some resources on the lived body in philosophy and the arts”, was in a way a parallel to the journey I’m on with this blog, though it’s much more a reference point, containing some key resources and insightful juxtapositions. This is where I found the astounding Merleau-Ponty quote above. Is it a surprise that I can put up with myself? Do I have a hunchbacked-consciousness? Do I know myself only through the (imagined) eyes of others? 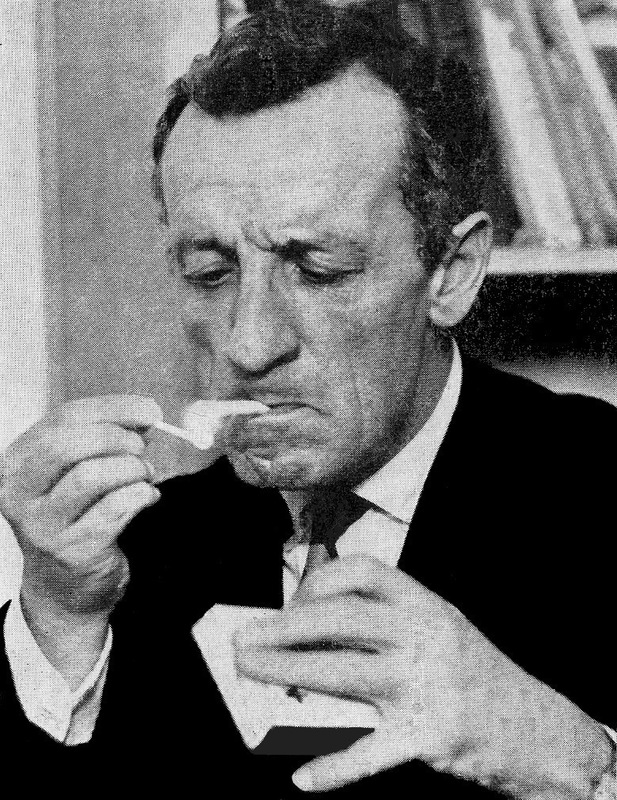 I know almost nothing of the life and physicality of Merleau-Ponty. Here he is smoking. The phrasing of the quote is intriguingly ambiguous. He says he is neither ‘jealous’, nor ‘inquisitive’, nor ‘hunchbacked’. That these words are held in quote marks seems to me to potentially imply that he is these things, yet is not defined by them. Consciousness is consciousness, shaped not by itself, but by its position in the world, in relationship. At the funeral, I had the sense that my friend was not in the coffin, or in heaven, or anywhere else but in the bodies of his family and friends. It was as if, without the central consciousness, his core of being, all that was left was the reflections, resonances, seeds, which we held in us. The day after, I was offered admission to a PhD program, with scholarship – my proposal was titled “Disabling Poetics: Bodily Otherness and the Saying of Poetry”. I’m planning to write a thesis and a series of poems which will “attempt to outline the mechanisms through which poetry can generate a productive, bodily encounter with the Other”, drawing on the ideas of Emmanuel Levinas and Tobin Siebers, and the work of a few of my favourite poets. I suspect that poetry is uniquely placed to incorporate (pun intended) the consciousness that arises from unusual bodies. We’ll see.